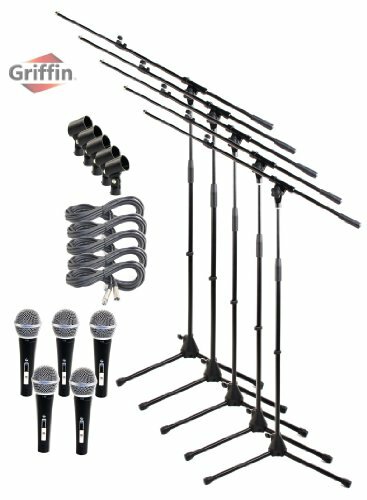 You will receive the following (20) items: (5) Telescoping mic boom stands (5) Microphone clips (5) XLR microphone cables & (5) Unidirectional dynamic vocal microphones. Maximum height with boom: 88"
Shaft length: 34" to 57"
Boom arm length: 17" to 33"
Length of each microphone: 6.5"
Includes Vocal Microphone by Fat Toad (Pack of 5) Boasting a live, full-range response and a deep bass, this pack of 6 cardioid dynamic microphones offer a smooth and natural sound and will work perfectly for any live music performance: from peaceful parties and jazz clubs to karaoke singing, vocals, recording, podcasting and loud stages. Their unidirectional design makes them sensitive to sound from one direction only and promises a high level of GBF (gain before feedback).